I like this idea. I think honey could work well too. Maybe some vodka instead of rum? I'm not a big rum fan. Simply refreshing and delicious combination. MMMMM....Olga! Delicious & healthy too! I love the rum addtion!! Yum! Any rum is a good thing. Great summer time dessert. I love healthy refreshing desserts like this. 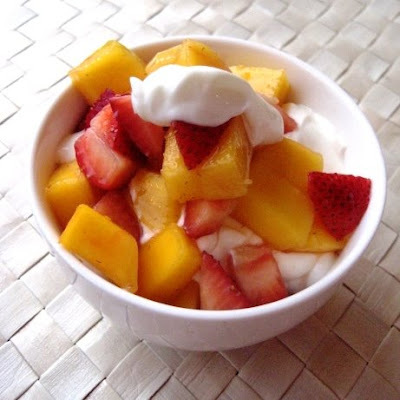 Fresh fruit, especially, one of my favorite combinations- mango and strawberry is always a treat in any form!! 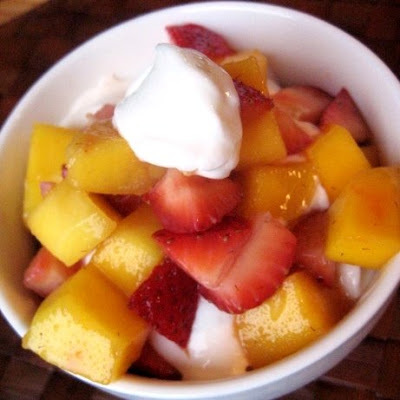 My mom always used to serve fruit and yogurt with dinner - I've yet to try greek yogurt though! I love putting fruits on my yougurt! yum yum! That is my kind of treat! Yum! Picked this up from FoodPhotoBlog. Great idea. I'm always looking for things to serve as dessert for my card club. The addition of rum makes this a lot more interesting.